GPR scans reveal the location of the two layers of structural steel, embedded electrical conduits, as well as the targets fitting a Typical Rebar Profile (TRP). Scan details have been physically marked with high-grade tape on the concrete floor. 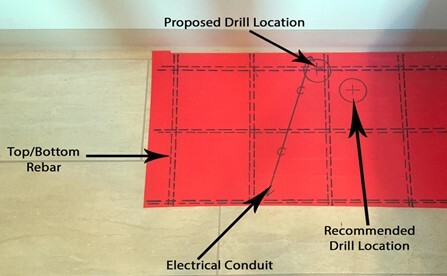 Based on these findings, a new drill location was proposed along with a recommendation to stay a minimum of 2” away from all marked targets. Core drill a 3” diameter hole into a finished concrete floor and avoid rebar/conduit.